Viruses are particles so tiny that they can’t be seen by an ordinary light microscope, but only under an electron microscope. They are not living organisms because they cannot carry out the necessary internal metabolism to sustain life, nor can they reproduce themselves. They are infectious particles, made up of DNA (or RNA) and protein, and can reproduce themselves only by hijacking the machinery of an infected living cell. The infected cell produces multiple copies of the virus, then bursts to release the new viruses so the cycle can repeat. Viruses come in many different sizes, shapes and designs, and they operate in quite diverse ways. 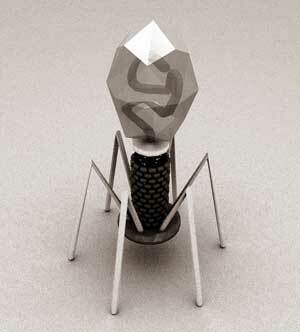 One of the most common types is the bacteriophage (or simply ‘phage’) which infects bacteria. It consists of an infectious tailpiece made of protein, and a head capsule (capsid) made of protein and containing DNA packaged at such high pressure that when released, the pressure forces the DNA into the infected host cell. Dr Smith and some colleagues at UCSD joined researchers from the American Catholic University (Washington, DC) to solve the problem.2 They analysed the bacteriophage T4 (above right)—a virus that infects E. coli bacteria, the type that inhabit human intestines—using ‘laser tweezers’ to hold onto a single molecule of DNA, and measure the force on it by the virus’s packaging motor. For its size, [this DNA packing motor is] twice as powerful as a car engine. They showed this motor exerts a force of >60 piconewtons. This sounds small (6×10-11 N), but for its size, it’s twice as powerful as a car engine. So the motor, a terminase enzyme complex, ‘can capture and begin packaging a target DNA molecule within a few seconds.’2 Such a motor must use a lot of energy, since the phospate groups are negatively charged so repel each other. So in one second, this one goes through over 300 units of life’s energy currency. This energy currency is the molecule ATP (adenosine triphosphate),3 and this itself is generated by a remarkable molecular motor, ATP synthase.4 The virus has a complementary motor-enzyme, ATPase, built into its packaging engine, to release the energy of the ATP. Just as it is good for a car to have brakes and gears, rather than only being able to go 60 miles per hour, the DNA-packaging motor may need to slow down, or stop and wait if it encounters an obstruction.—Doug Smith, researcher. This motor is just another example of the complexity required even for sub-life forms such as viruses to exist, let alone real life. Since life requires long molecules to store information and pass it on to the next generation, there must also be machinery just to deal with its awkward physical properties before life can even get started by chemical evolution. Here are two more machines just to deal with the long thready properties of DNA, so that life can function. Since replication is vital for life, helicases are vital to all living organisms. Dr Wang’s colleague Smita Patel pointed out also, ‘Helicases are involved in practically all DNA and RNA metabolic processes’. Further, as Dr Patel explained, ‘Defects in helicases are associated with many human diseases, ranging from predisposition to cancer to premature aging.’ So the origin of such elaborate machinery and the energy source is just one more problem for chemical evolution to solve. Even the copying of the right part of the DNA to mRNA so that its information can be read requires intricate machinery. This involves an enzyme called RNA polymerase, comprising four protein chains. And another protein tells the RNA polymerase where to start reading the DNA template. Then the enzyme complex moves along the DNA strand, adding the matching RNA letters one at a time, then stops in the right place. Richard Ebright and his team from Rutgers University have discovered more intricacies in this process of transcription,8,9,10 Indeed, it is this mRNA that is translated into proteins in the complex machines known as ribosomes. There are many ‘chicken-and-egg’ problems for the naturalistic origin of life. Life depends upon the long double-thread information molecule DNA, and it could not function without machines capable of dealing with such long double-threaded molecules. Yet the information for these machines is coded on the threads! These machines require the ATP synthase motor to generate and use their energy, yet this motor is also coded on the DNA. The code needs the machines, and the machines need the code. Life presents us with many such ‘chicken-and-egg’ problems for which naturalistic theorists have no answer. Creationists do have an answer—in the beginning, God created a fully functional chicken, which then laid an egg. Problem solved! This is an accurate science animation of the T4 bacteriophage virus that shows how it packs DNA into the head/capsid of the virus. These models were generated from data provided by the Michael Rossmann Lab at Purdue University. Germ with seven motors in one! Did God make pathogenic viruses? Powerful Molecular Motor Permits Speedy Assembly of Viruses, Physorg.com, 29 October 2007. Return to Text. Fuller, D.N., Raymer, D.M., Kottadiel, V.I., Rao, V.B. and Smith, D.E., Single phage T4 DNA packaging motors exhibit large force generation, high velocity, and dynamic variability, Proceedings of the National Academy of Sciences, US 104(43):16868–16873, 23 October 2007. Return to Text. Bergman, J., ATP: The Perfect Energy Currency for the Cell, CRSQ 36(1) June 1999 Return to Text. Sarfati, J., Design in living organisms (motors), Journal of Creation 12(1):3–5, 1998; <www.creation.com/motor>. Return to Text. Mechanism of T7 Primase/Helicase (includes animation). Return to Text. Johnson, D.S., Bai, L., Smith, B.Y., Patel, S.S., Wang, M.D., Single-molecule studies reveal dynamics of DNA unwinding by the ring-shaped t7 helicase, Cell 129(7):1299–1309, 29 June 2007. Return to Text. Researchers solve mystery of how DNA strands separate, Physorg.com, 3 July 2007. Return to Text. Nanotech tools yield DNA transcription breakthrough, Physorg.com, 16 November 2006. Return to Text. Revyakin, A. et al., Abortive initiation and productive initiation by RNA Polymerase involve DNA scrunching, Science 314(5802):1139–1143, 17 November 2006. Return to Text. Kapanidis, A.N. et al., Initial transcription by RNA polymerase proceeds through a DNA-scrunching mechanism, Science 314(5802):1144–1147, 17 November 2006. Return to Text. Roberts, J.W., RNA Polymerase, a Scrunching Machine, Science 314(5802):1139–1143, 17 November 2006 (comment on refs 9 and 10). Return to Text. See also Sarfati. J., More marvellous machinery: ‘DNA scrunching’, J. Creation 21(1):4–5, 2007. Return to Text.